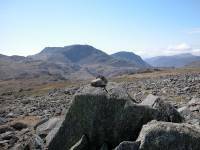 On the second day of an excellent Mayday holiday I decided to revisit Allen Crags and Glaramara, outliers of Scafell Pike, and to visit the other tops on the same ridge. 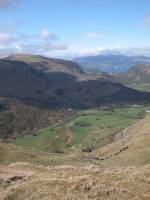 I started off, as did many others that morning, by taking the 9.20 bus from Keswick to Seatoller. 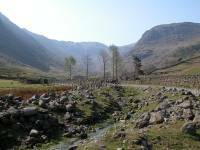 It's necessary to walk from here along the road to Seathwaite farm. The road has glorious views all the way to Great End. 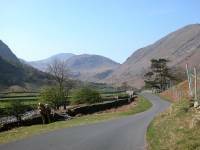 There were so many cars parked at Seathwaite that the verges were full up to a quarter of a mile from the farm. 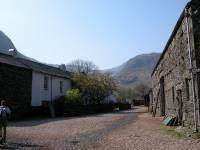 This is the yard of Stan Edmondson's farm at Seathwaite. Beyond the farm is a wide track that runs close to the stream. 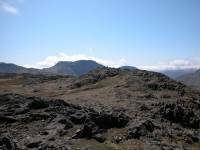 Glaramara, which is one of the objectives of today's walk, dominates the view southwards along the valley. 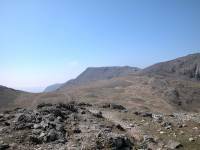 Seathwaite Fell lays to the right. Further along the valley. It's still relatively level here but soon the path will start to climb. 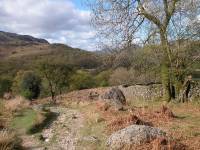 Stockley Bridge, a well known beauty spot. On a warm summer afternoon there are always crowds of people here, picnicking and swimming. 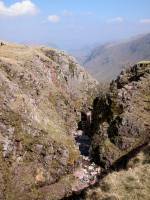 Grains Gill, seen from the parapet of the bridge. Across the bridge is a major path junction. 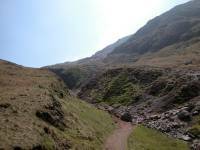 The path to the right climbs past Taylor Gill Force and along Sty Head Gill, heading for Sty Head Tarn. 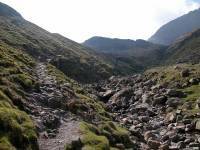 My route, however, goes to the left alongside Grains Gill. 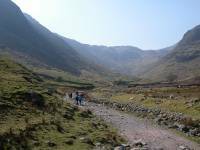 Looking back down the valley towards Seathwaite. The path is climbing significantly now. 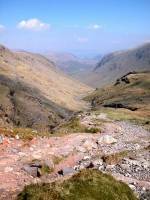 The brooding north face of Great End looms at the head of the valley. The Grains Gill path has a good many picturesque little spots like this. A cascade beside the path. The gradient gets a bit more serious now. 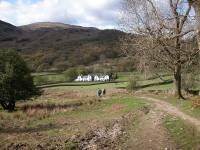 Ray McHaffie and his crew rebuilt this path for the National Trust in the 1980's. They made a really good job of it. Another picturesque little fall by the path. 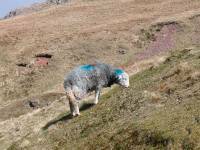 It's getting rockier now and a bit of clambering is involved. Hands out of pockets! 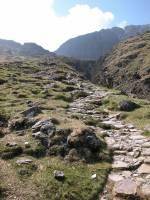 The path climbs high above the stream bed at a steep section. Nearing the head of the stream now. 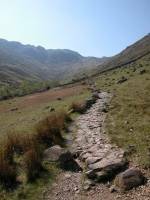 It takes roughly an hour and a quarter to ascend the path from Stockley Bridge. 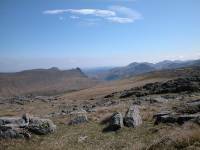 Now we can see across to Glaramara, one of the day's main objectives. 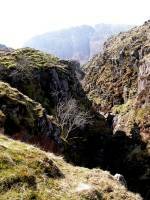 The impressive ravine at the head of Grains Gill. 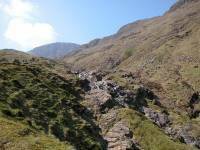 From here on it's known as Ruddy Gill. 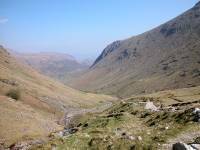 The Grains Gill valley from the head of the gill. 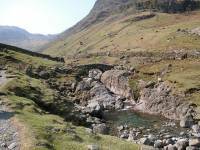 Many walkers stop here for a breather. 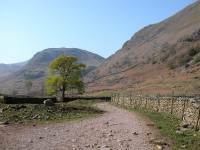 The path follows Ruddy Gill around to the left. A last view of the ravine. 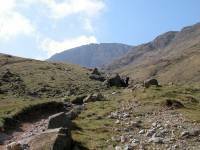 As the path climbs alongside Ruddy Gill to the east, Great Gable appears over the col. Sprinkling Tarn lies just over the lip of the col, a couple of hundred metres away. 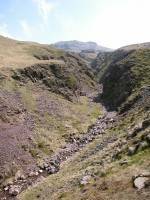 Ruddy Gill, with Great End rising to the right. 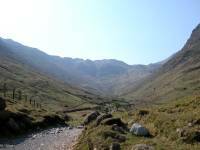 The path crosses the bed of Ruddy Gill and rises towards Esk Hause beyond. 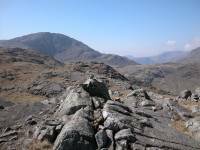 That's Allen Crags, the day's first summit, now only ten minutes away. The alternative look for the modern sheep. 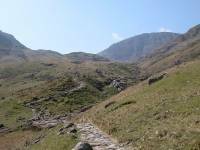 The path forks, the right hand track heading to Esk Hause and Scafell Pike, the left hand track heading for Angle Tarn and Langdale. 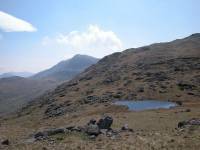 Here we can see back to the Gables and Sprinkling Tarn. The summit of the path. 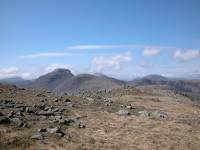 That's Bowfell in the centre of shot, Esk Pike rising to the right. 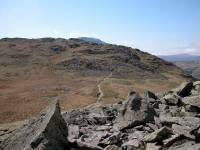 Now we turn left for Allen Crags. 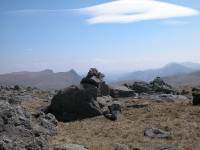 A few minutes later and I've arrived at Allen Crags, 2572 ft. 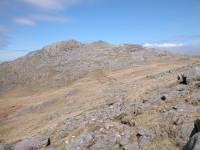 Surprisingly, this fell is far less famous than it deserves to be and many walkers regard it as a minor top that needs to be crossed on the way to Glaramara. 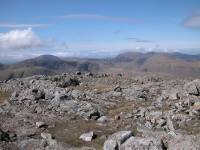 Here I'm looking south from the summit cairn to Bowfell and Esk Pike. 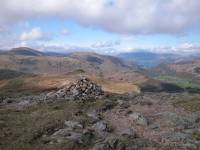 The Gables, seen to the west from the summit of Allen Crags. Looking north along the ridge. 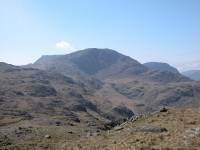 Between Allen Crags and Glaramara are a number of tops, some of which count as Hewitts or Nuttalls. Much of the intervening country is very rocky, a consequence of the volcanic origins of the area. 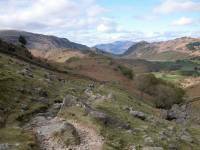 Looking to the east, where the Langdale Pikes appear above Rossett Pike. 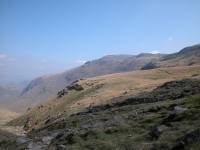 That's not Glaramara ahead, just the minor top of High House. 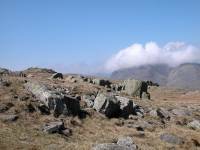 Great Gable from the descent to the first col, with cumulus clouds lapping over the ridge from the west. 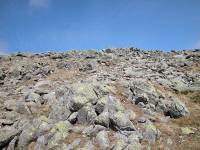 The rocky terrain of the col. 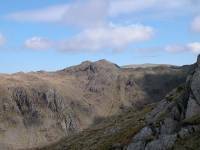 The Langdale Pikes seen beyond one of the many tarns on the ridge. 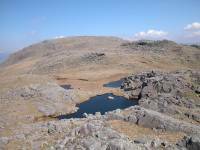 Walkers unfamiliar with the terrain might be forgiven for thinking that this is High House Tarn. It's not. Barely visible on the maps, it doesn't even have a name. 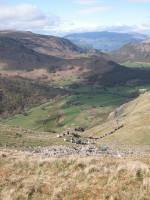 The Gables seen through a rocky gap as I ascend High House. 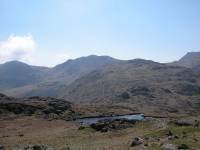 Looking back at the tarn, with Bowfell peeping round the corner. 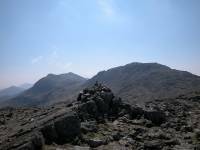 The summit of High House, otherwise known simply as Allen Crags (North Top). 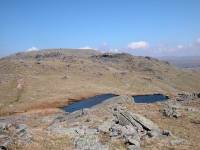 Strictly, this top is nameless, but the Hewitts named it for High House Tarn which it overlooks. We're looking south here, to the prominent cliffs of Great End. 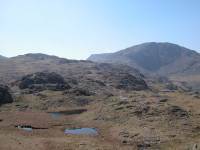 Sprinkling Tarn is visible. 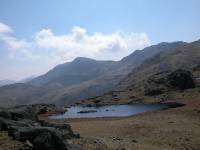 High House Tarn, with yet more minor tops beyond. 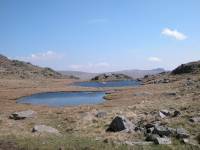 High House Tarn at the col. 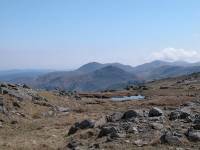 Looking across the tarn to the southeast, with Bowfell and Esk Pike beyond. 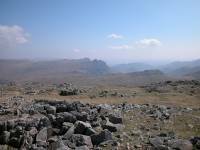 Looking back at High House Top and Great End. 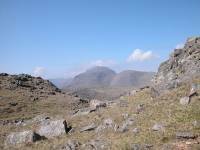 Ill Crag is coming into view to the left of Great End. 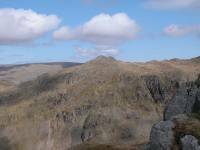 Great End in all its glory, flanked by Ill Crag (left) and Lingmell (right). 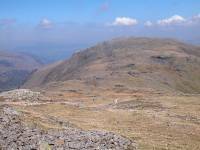 A southern panorama - Bowfell, Esk Pike and Ill Crag overtopping High House. Another nameless top, at 2365 ft. 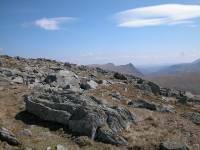 It qualifies as a Hewitt, and that list simply names it as Glaramara South Top, but the Nuttalls name it for Red Beck. 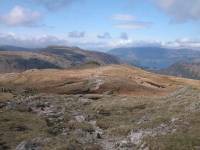 The summit of Red Beck Top, seen here, lays off the path to the west and it's a fair bet that few walkers ever seek it out. 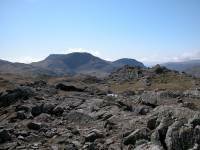 The Langdale Pikes and the Coniston fells are seen in the distance. 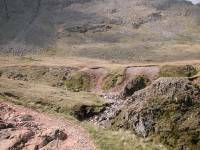 One of the many rock formations between Red Beck Top and Looking Steads. 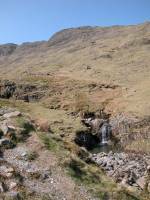 There's only a very brief col north of Red Beck Top before the climb of Looking Steads begins. 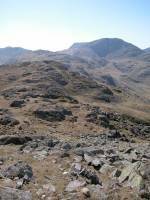 It's very rocky and the ascent is a mild scramble that some walkers would find daunting. 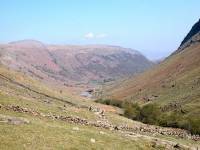 Looking back at Red Beck Top and the col.
A fine view of Great End. Nearing the bouldery summit of Looking Steads. 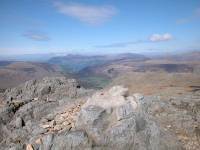 The Langdale Pike, and a view right across the Lune valley to the Yorkshire Dales. 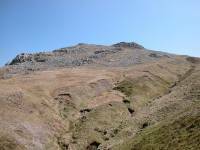 The summit of Looking Steads, 2543 ft and another Nuttall. 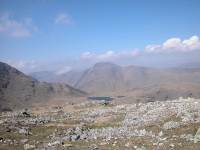 Ill Crag, Great End and Lingmell from the summit cairn. 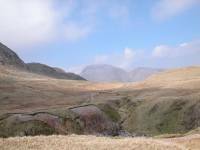 Further round we see Great Gable, Kirk Fell and Pillar. 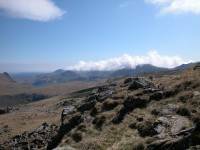 It's now only an 800 metre walk to Glaramara itself. Here at last. 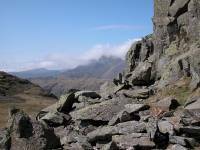 Glaramara, 2560 ft high. But it's a confusing summit. 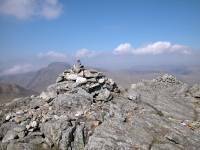 There are two cairns - there's the second one. 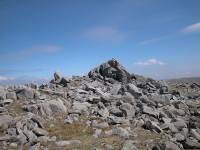 And about 150 metres to the north there's a second summit, with two more cairns. 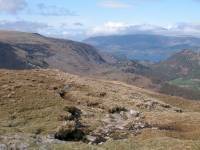 The view towards High Stile (left) and Grasmoor (right). 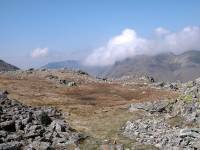 The Langdale Pikes and Coniston fells from Glaramara. 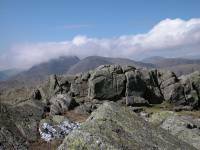 From the other summit we're looking southeast towards Pike o' Blisco and the Coniston fells. 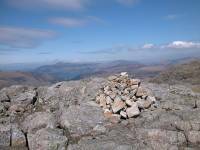 This is the northern summit. Wainwright declares it to be the "official" though to me the first (southern) top looks slightly higher. 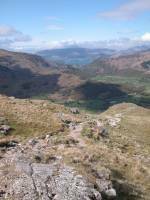 No doubt, though, that this is where you get the best view of Derwentwater and Kewsick. 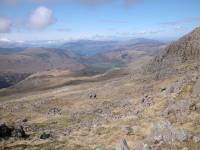 Looking back at the south summit with Great End and Lingmell behind. 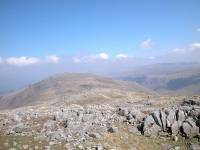 "Candyfloss" clouds spilling over the tops of Bowfell and Esk Pike. 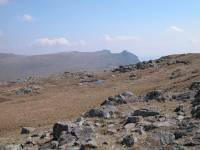 ....the tendency of all paths leaving the summits to peter out. Cairns everywhere, and none of them seem to do much good. Ah, that looks like a path. And that's Dovenest Crag, a little further south. 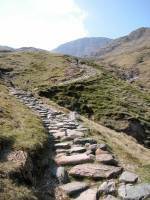 The path along Thorneythwaite Fell descends steeply in parts. I wouldn't like to come up this way. 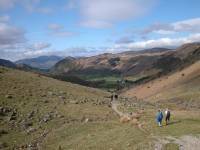 Upper Borrowdale, spread out below. And quite a long way down. There's Seatoller. Hopefully I'll be in good time for the bus. 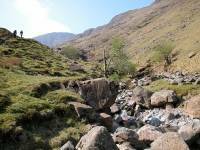 I stopped here for a tea break and was overtaken by a party of walkers from Tyneside, who stopped in turn just below me. 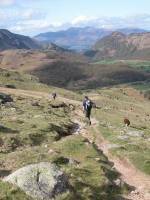 Losing height fast now, with Castle Crag seen dead ahead. 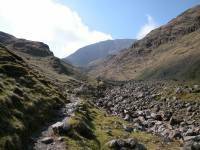 After a number of minor scrambly bits necessitating six point contact (sliding down on your bum), I'm coming down to Comb Gill. The path reaches the first intake wall and meets tree cover. 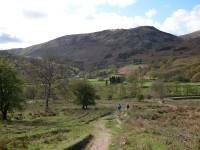 Open woodland alongside Comb Gill, as the path drops to valley level at last and approaches Mountain View cottages. Now available on CD - the high resolution (2560 x 1920 pixel) originals of the images on this gallery. 99 images, 142MB of data. (includes some images not selected for the website).